A Ryanair plane at Thessaloniki airport in Greece. RYANAIR HAS SAID that its first-quarter profit dropped a fifth and has warned of potential job losses due to the company’s ongoing strike problems. The expected decline in profits was previously flagged by the airline, something it blamed on “the absence of half of Easter in the quarter, higher oil prices and pilot costs”. Profit after tax slid 20% to €319 million in the three months to the end of June compared with a year earlier. The earnings update comes as Ryanair faces strikes this week by some pilots and cabin crew despite group efforts in recent months to improve pay and conditions. Referring to its first quarter, Ryanair noted that “staff costs increased by 34% primarily due to pilot 20% pay increases, 9% more flight hours and a 3% general pay increase for our non-flight staff”. 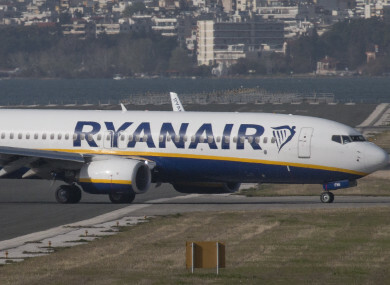 On the ongoing industrial disputes, Ryanair said that it expects further strikes over the summer because it is “not prepared to concede to unreasonable demands”. Some of Ryanair’s Ireland-based pilots will carry out a third one-day strike tomorrow, resulting in the cancellation of 16 flights. “Despite signing pilot and cabin crew union recognition agreements in our major markets — the UK and Italy, and a recent agreement in Germany… progress has been slower in smaller markets,” Ryanair said in today’s statement. “While we continue to actively engage with pilot and cabin crew unions across Europe, we expect further strikes over the peak summer period as we are not prepared to concede to unreasonable demands that will compromise either our low fares or our highly efficient model,” it added. If these unnecessary strikes continue to damage customer confidence and forward prices/yields in certain country markets then we will have to review our winter schedule, which may lead to fleet reductions at disrupted bases and job losses in markets where competitor employees are interfering in our negotiations with our people and their unions. We cannot allow our customers flights to be unnecessarily disrupted by a tiny minority of pilots. The Dublin-based carrier noted also that oil prices had “risen substantially from $50 per barrel at this time last year to almost $80 per barrel”. Ryanair added that its passenger traffic grew 7% to 37.6 million in its first quarter, while revenue increased 9% to almost €2.1 billion. Email “Ryanair issues warning about job losses amid ongoing pilot strike actions ”. Feedback on “Ryanair issues warning about job losses amid ongoing pilot strike actions ”.